– If you don`t want to use hot water or machines with water extraction – you can always take advantage of dry cleaning. It`s very useful and a perfect way for cleaning carpets and rugs without the need to wait them for drying outdoors or under a direct sunshine. Dry cleaning is recommended especially for handmade carpets and rugs or these with longer natural fibers, which are brightly colored and with highly saturated nuances. These carpets shouldn’t be exposed on direct sunlight at all or at least for a short time. It`s the best way to prevent your beautiful rugs with natural bright fibers from discoloration or staining. Thus, for the perfect deep cleaning, you can use a dry cleaning system like dry compounds, foams and detergents, and always pre-vacuum first to remove the bigger dirt and sand particles from the fibers. – Hot water extraction is another famous method for deep cleaning floors with carpets and rugs, and the best thing is that usually you don`t need to remove or replace the carpet from its original position. Just remove the table, the chairs or any other big heavy object that`s on the carpet so to expose its entire surface. Pre-vacuum and treat with a rental carpet cleaning machine or call the professional cleaners for very persistent and heavily soiled carpets. Or else, make your own homemade solution for spot cleaning. Apply it onto the stains and let it soak up for a couple minutes. Then, scrub gently with a clean towel and remove the dissolved blemishes by frequently cleaning the towel with clean water. – Clean with a grooming brush carpets and rugs with short fibers. 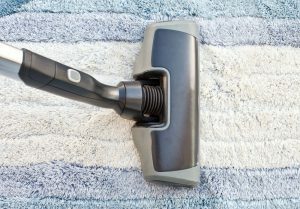 This is more convenient for thin synthetic carpets, which get easier dirty but they are also easier to clean. Apply a detergent solution only onto the spot and scrub with the brush until it forms a foam. Then wipe it off and treat the spot only with water until the detergent agent completely disappears. Run the vacuuming machine and go through the already slightly wet spot to ruffle the fibers and to make them fluffy like new. – Spray protective solution onto the coverings to prevent them from further staining or at least to enhance their protective qualities. The spray adds a tiny layer of protection and makes the fibers shinier while enhancing the colors in the meantime. Some sprays also act as deodorizing agents and so you can easily spread your favorite fragrance through the carpet coverings. – If you have big pets like cats and dogs, another great idea is to use a special deodorizer that penetrates through the fibers to eliminate all the animal odors, and so it reduces the chance from breathing volatile allergens.